As human beings we like to think we're generous, but if we're really honest with ourselves, most of us have to admit to secretly stashing favorite food treats. As human beings we like to think we're generous, but if we're really honest with ourselves, most of us have to admit to secretly stashing favorite food treats, so that when the time's right or the craving hits, we'll have it all to ourselves. I polled a wide swath of family, friends, acquaintances, and co-workers to come up with these 10 secret spots. 1. Bottom Shelf of the Refrigerator: This might not sound like a hiding place at first, but it's got all the right qualities: it's dark and not easily visible unless you bend way over or get down on one knee, which is much more effort than most people exert when looking in the fridge for something to eat. My vice is chocolate -- bittersweet bars, brownies, and chocolate chip cookies -- and that's where I stash it. Unfortunately for me, chocolate also happens to be a favorite of my husband and daughters. When our girls were tots, I hid my hoard in the freezer out of their reach. That worked until my husband found the goodies. So I switched to the very back of the bottom shelf of the fridge because, let's face it, who besides mom sticks her hand back there? 2. Cleaning Supplies Cabinet: It holds the same level of attraction as the bottom shelf of the fridge, but the food had better be well sealed. "I have to hide food all the time from my husband," wrote a colleague. "The cleaning supplies cabinet is a place he's sure never to look." 3. Dishwasher: Several pals swear by the dishwasher. The males in their households don't make use of that appliance. A mum with several sons thought she was getting away with it until one child happened to open the dishwasher and found a box of cookies there. He whispered worriedly to his father, "I think Mum is going crazy. She put cookies in the dishwasher!" 4. 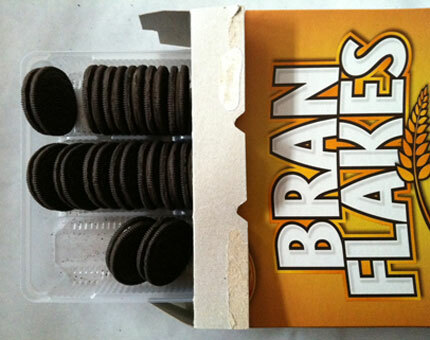 Empty Bran Flakes Boxes: If you're a kid, bran flakes are totally out of the question when you come home from school, ravenous for a snack. That's what one mother figured, and she's been happily sneaking cookies from those boxes for years. 5. Trompe L'Oeil Book Boxes: Talk about hiding in plain sight! A friend married to an art collector keeps a couple of antique-looking books on her night table. Open them up, and they're perfect hiding places. Note the chocolate stashed in the open box at the right. The book boxes actually arrived as a gift filled with handmade chocolate bonbons. The art collector has yet to inquire why he never sees her reading the books! 6. Empty Shampoo Bottles: A former camp counselor reported that she was ordered to do random candy searches in the bunkhouse she shared with a gaggle of 13-year olds, and discovered just how creative the kids could be. A rattling shampoo bottle hid a mother lode of M&M's. Of course the counselor had to sample them to make sure the camper hadn't been poisoning herself with shampoo! 7. Mattress Covers: It turns out that campers are a rich source of ideas for hiding places. The aforementioned camp counselor also found candy tucked away between the mattress and zipped-on mattress cover. Need a sugar fix? Just unzip your mattress cover! 8. Kleenex Box: The mother of a camper was reminded by her daughter that the mother herself made sure to stuff Skittles underneath the tissues in a Kleenex box packed in the top of the duffle. When the camper unpacked, she transferred the candy to the front pouch of a folded sweatshirt into which she dipped daily until, oops, the ants found it, too. 9. Underneath Garden Dirt: A very resourceful mother hid packets of M&M's in strategic spots under rocks and dirt in the garden as an incentive for this colleague and, he suspects, for his mother as well, to keep them both on track with gardening projects when he was younger. 10. The Snow Boot Chest: Another friend's grandmother kept freshly made Christmas cookies in tins she stuffed in what he described as the "weird snow boot chest" in the pantry. She did such a good job of hiding them that they often weren't found until she was spring-cleaning for Easter. Despite being a tad stale, her grandchildren devoured them. Other Priceless Reactions: One colleague admitted she used to hide food, but then forgot where she hid it, so she gave up on that idea. Another colleague said, "I wish I could say that I actually devour my treats slowly enough to hide them anywhere but for the most part I just eat them. All. At once." Where do you hide your foodie booty?